Obtaining sufficient amounts of vitamin B12 is essential for every cell in the body as it plays a key role in DNA replication. The recommended daily intake of vitamin B12 is 2.4mg per day to ensure a wide range of health benefits including energy production, regulation of the nervous the system, reduction of cardiovascular disease, encouraging optimal digestion and essential for hair, skin and nails. Vitamin B12 is synthesised only by certain bacteria in the digestive tract which are found in high concentrations in bodies of predators located higher in the food chain. The highest sources of B12 are found in foods such as red meat, poultry, milk, eggs, fish and shellfish. Lifestyle and dietary choices such as Lacto-ovo diets, raw-veganism or fruitarianism are highly restricted in these sources of vitamin B12 which coincides with the high prevalence of vitamin B12 deficiencies these particular groups. This raises the question to which plant based foods offer the most therapeutic levels of vitamin B12 to ensure adequate amounts are met in vegetarian based diets. From a nutrient perspective a vegetarian diet is usually rich in carbohydrates, dietary fibers, carotenoids, folic acid, Vitamic C, Vitamin E, Omega-6 and magnesium, however the diet is commonly low in vitamin B12, proteins, saturated fatty acids, Omega-3, Vitamin A and vitamin D3. Vegan diets are well known to have a high intake of dietary fibers, low intake of saturated fats and health-promoting phytochemicals found in fruits and vegetables which promotes healthy weight and heart health. Despite this, due to the vital role B12 plays in metabolising homocysteine, vegetarians are still at risk of cardiovascular diseases along with other neurological degenerative diseases. These risk factors are one of the main reasons to introduce fortified foods in the western diet with aims to address vitamin B12 deficiencies. The most common form of vitamin B12 used fortified foods such as breads and cereal is cyanocobalamin due to it being most commonly stable yet most unnatural form. Cyanocobalamin needs to convert into methylcobalamin and 5-deoxyadenosylcobalamin in the body to become active. Questions are raised to weather this form of vitamin B12 is safe as it requires using ‘methyl groups’ in our body that is used in the breakdown of homocysteine which may further increase the risk of cardiovascular diseases. With many vegetarians becoming more aware and seeking unprocessed foods, fortified foods have not been effective in addressing B12 deficiencies in vegetarian diets. Seeking vegetables sourced from organic farms that use permaculture philosophy is common choice for vegetarians. One study found an increase in vitamin B12 levels in spinach leaves (approximately 0.14mg/100gm) occurred when grown from organic fertiliser derived from cow manure. However, to receive the Recommended Daily Intake (RDI) of 2.4mg/day for an adult, a consumption of several hundred grams would need to be ingested which is hard to obtain. More interestingly another study found that most organic fertilisers made from animal manures had high amounts of inactive vitamin B12 which were excreted in human faeces of more then 98% which indicates a poor conversion rate into the active forms methylcobalamin and 5-deoxyadenosylcobalamin. More popular foods that have has recent attention in vegetarian based diets are fermented foods such as tempe, kimchi, saurkrauet and kombucha. Unfortunately these fermented foods only contains trace amounts and do not hold a sustainable source of B12 (ie Kimchi <.01 for every 100mg). Edible mushroom species are popular among vegetarians in European counties and are yet to have as much appreciation in the western world. 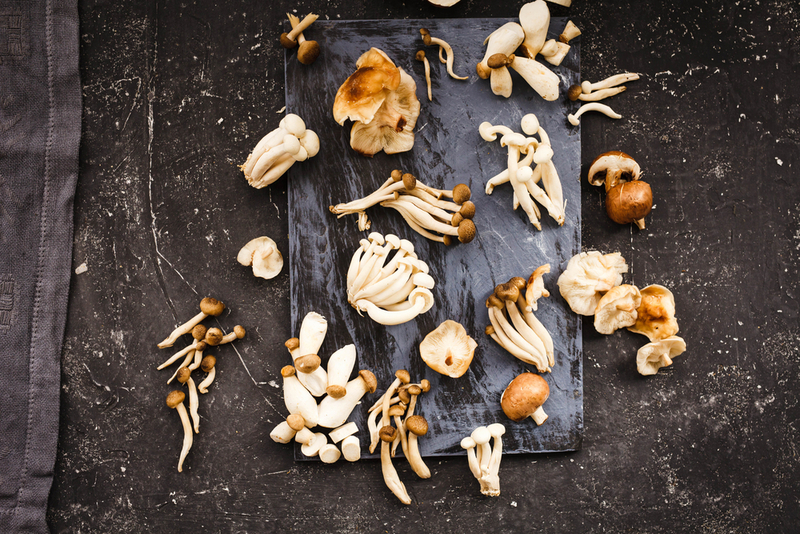 Mushrooms such as porcini mushrooms, parasol mushroom, oyster myscroom and black morel show trace levels of vitamin B12 (.09 mg/100gm dried weight). More excitingly the black trumpet and golden chanterelle contain higher levels of vitamin B12 (1.09-2.65 mg/100g dry weight). Shitake mushrooms may prove to be the most beneficial in vegetarian diets as dried shiitake mushrooms are around 5.6mg per 100 gm dried weight). This means that the daily intake of approximately 50gm of dried shiitake mushroom will meet the 2.4mg/day for the average adult! The edible algae laver is also known as nori and is most commonly seen in Sushi Trains in the wrapped around rice and tuna. Nori shows to have one of the highest bioavailable sources of vitamin B12 that may hold many benefits for correcting vitamin B12 deficiencies in vegetarian diets. Dried green laver and purple laver are the most widely consumed edible algae and contain a substantial amount of Vitamin B12 (approximately 63.6 mg/100g and 32.3 mg/100g dry weight). It is important to note that the processing stages of algae such as toasting or seasoning can affect the vitamin B12 status. In one study where dried purple laver was treated by toasting until the laver colour changed from purple to green, decreased in Vitamin B12 due to the heating process. Despite this, edible purple laver in particular contains coenzyme that increase the bioactive forms of vitamin B12 in the body. Further health benefits of consuming purple laver were emphasised in a nutritional analysis of six vegan children who consumed a diet including brown rice and dried purple laver for 4-10 years which suggested that the consumption of nori may prevent vitamin B12 deficiency in vegans. Edible mushrooms and edible algae are undoubtably the most nutritional and highly active sources of vitamin B12 needed in a vegetarian based diet. Incorporating these functional foods will not only decrease the amount of vegetarians with vitamin B12 deficiencies, but also allow for the recommended daily intake of B12 to be met which most vegetarians struggle with. In doing this, vegetarians will lower the risk of degenerative diseases and increase their vitality and live in the most optimal health possible. Why Pilates Is So Abmazing! How do we scale a mountain?